The 370th Air Expeditionary Wing (AEW) is a provisional United States Air Force unit assigned to United States Air Forces Central, which may activate or inactivate it at any time. The unit was last stationed in Iraq, and was likely inactivated in 2011 as part of the United States pullout of forces. The 370th Air Expeditionary Wing was originally constituted as the 1st Transport Group in 1933. As a Regular Army Inactive unit, it was assigned reserve personnel in early 1934 only for training purposes. From February to May 1934, the group was provisionally organized at Columbus, Ohio. In 1937, the group was consolidated with the 10th Observation Group, also constituted in 1933 but never activated. The consolidated group was designated the 10th Transport Group and activated on 20 May 1937. Its original squadrons were the 1st, 2d, 3d, and 4th Transport Squadrons. It provided a single headquarters for these squadrons, which had been assigned to the various Air Depots in the United States. The group headquarters and one of its squadrons were located at what is now Wright-Patterson Air Force Base, Ohio. It operated single-engine Bellanca C-27 Airbus and twin-engine Douglas C-33 transports as part of the logistics organization of the Air Corps on routes in the US and to Alaska and the Canal Zone, transporting supplies, materiel, and personnel. In May 1941, two of the group's squadrons were reassigned to provide cadres for newly forming transport groups as the Air Corps expanded. The 3d Transport Squadron was reassigned to the 63d Transport Group, while the 4th Transport Squadron was reassigned to the 62d Transport Group This left the group with two of its original squadrons, plus the 5th Transport Squadron, which had activated under the group in 1939. On April 30, 1942, the group transferred to the Air Transport Command (later I Troop Carrier Command) (I TCC) and was redesignated as the 10th Troop Carrier Group two months later. 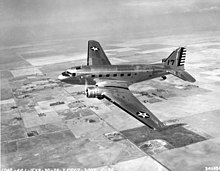 It converted primarily to Douglas C-47 Skytrain aircraft, but also flew other military models of the Douglas DC-3. After its transfer the group acted as an Operational Training Unit (OTU), OTUs were oversized units that trained cadres for "satellite" troop carrier groups. In 1943 the group was given the additional duty of acting as a Replacement Training Unit training replacement aircrews. In February 1943, the last of the group's original squadrons, the 1st and 2d Troop Carrier Squadrons (TCS) deployed to the CBI Theater and were assigned to Tenth Air Force. The following month, they were replaced by the 307th and 308th TCSs. During the next two years, the group moved frequently to various I TCC stations, while its squadrons were frequently located elsewhere. All squadrons except for the 38th TCS, located at Laurinburg-Maxton Army Air Base, North Carolina were colocated with group headquarters by early 1944. The Army Air Forces found that standard military units, based on relatively inflexible tables of organization were proving less well adapted to performing the training mission. Accordingly, a more functional system was adopted in which each base was organized into a separate numbered unit. As a result, the 10th was disbanded in April 1944 and its mission, personnel, and equipment were combined with the support organizations at Alliance Army Air Field and transferred to the 805th AAF Base Unit (Replacement Training Unit, Troop Carrier), while that of the 38th TCS was transferred to the 810th AAF Base Unit (Combat Crew Training School, Troop Carrier). The 370th Air Expeditionary Advisory Group (AEAG) was activated as part of the Global War On Terror on 29 March 2007. Its activation ceremony at New Al Muthana Air Base was delayed until late April. The mission of the 370 AEAG was to restart the Iraqi Air Force by training Iraqi Air Force aircrews how to operate, employ and maintain Lockheed C-130 Hercules and Mil Mi-17 aircraft, and to maintain and operate as a self-sufficient air base. This mission was known as "CAFTT" for Coalition Air Forces Training Team. The unit was made up of Airmen from a variety of career specialties and it was assigned to Second Air Force as part of Air Education and Training Command. The 370 AEAG was made up of Airmen from a variety of career fields. Rockwell Field, California (moved to McClellan Field, California, with air depot). ^ a b c d e f g Maurer, Maurer, ed. (1983) . Air Force Combat Units of World War II (PDF) (reprint ed.). Washington, DC: Office of Air Force History. pp. 52–53. ISBN 0-912799-02-1. ^ a b Clay, Steven E. (2010). U.S. Army Order of Battle, 1919–1941 (PDF). 3, The Services: Air Service, Engineers, and Special Troops, 1919–41. Fort Leavenworth, KS: Combat Studies Institute Press. p. 1296. ISBN 9780984190140. LCCN 2010022326. OCLC 637712205. Archived from the original (PDF) on 27 September 2013. Retrieved 27 November 2012. ^ a b c Maurer, Maurer, ed. (1982) . Combat Squadrons of the Air Force, World War II (PDF) (reprint ed.). Washington, DC: Office of Air Force History. pp. 9–10. ISBN 0-405-12194-6. ^ Goss, William A (1955). "The Organization and its Responsibilities, Chapter 2 The AAF". In Craven, Wesley F; Cate, James L (eds.). The Army Air Forces in World War II. Vol. VI, Men & Planes. Chicago, Illinois: University of Chicago Press. p. 75. LCCN 48-3657. Clay, Steven E. (2010). U.S. Army Order of Battle, 1919–1941 (PDF). 3, The Services: Air Service, Engineers, and Special Troops, 1919–41. Leavenworth, KS: Combat Studies Institute Press. ISBN 9780984190140. Archived from the original (PDF) on 27 September 2013. Retrieved 27 November 2012.